I'm on a 777-200 from Chicago O'hare to Honolulu International, on a vacation to Maui. Kim and I are all the way in the aft, but that's okay as it's mostly empty back here and it's nearly a 9 hour flight! I'm in 47J but I see some open seats on the port side. After take off I jump into one of those as I know what will be coming up on that side in about two hours! I got a few lovely shots going over the Rockies and saw some picturesque views of Utah just north of the Grand Canyon -truly spectacular! 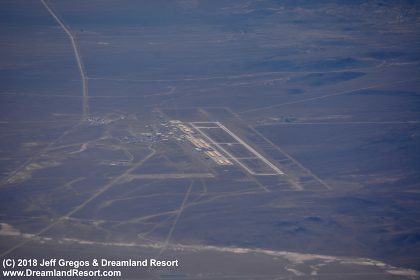 I can see a fire burning below and I noticed a TFR regarding that on www.skyvector.com. But the best view is coming up. Just when I think we were too far north, a familiar sight comes into view. 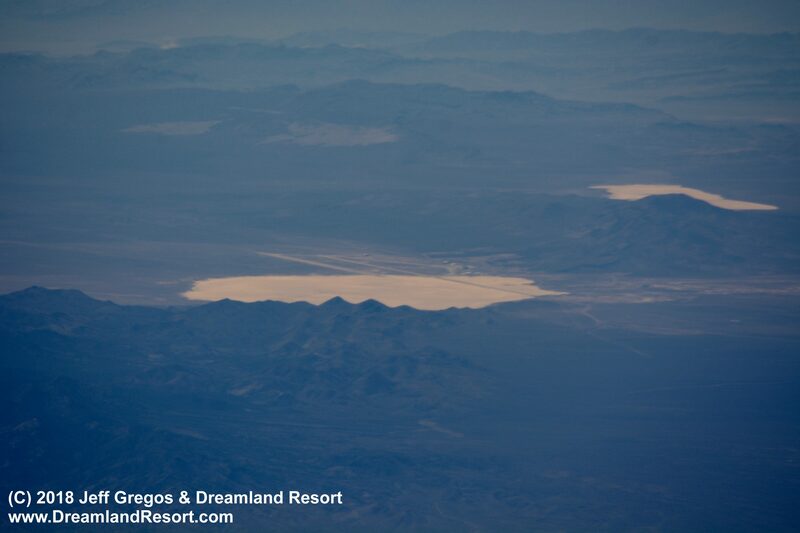 Holy crap, that's Sand Spring Lakebed so that would be Groom Lake with Papoose and Yucca in the distance! For the trip I packed my Nikon D7100 with my 55-300mm lens. I left my newly purchased 80-400mm seeing how there isn't any "Birdwatching" in Maui. And when I say "birdwatching," I mean the birds that can fly 1500 mph and rain death upon bad people doing bad things! It's early afternoon so the haze was building up even on a cloudless day. Looks like another beautiful day in Rachel. The 400mm jobber probably wouldn't have made a difference seeing how I was switching from AF to Manual to get "clear" shots. In addition to my Nikon, I had my GoPro Hero4 which I didn't set up because of it's fisheye lens. But now wish I did. I did however have my Canon Image Stabilizing Binoculars in case we had an early whale visit to the islands. We normally go around the Thanksgiving Holiday (late November for the rest of the world) and we see a lot of whales from our balcony then. With the binoculars, you can clearly see buildings plain as day. Darn, I wish there was a camera in those binoculars! I thought, this sure beats climbing Tikaboo for a picture. Kim hogged the binoculars, as I snapped maybe 75 pictures as we passed. I'm sure the girl in the row behind us was wondering what's this nut job is taking so many pictures of? It's the desert! All there is is stupid sand! LOL!!! As we passed I got a rare glimpse looking straight down the runways -an angle I have never seen before other than in a flight simulator. If I were the Captain, I would have got on the PA and said, "Uhhhhhhhh, ladies and gentlemen, [long pause] on your left side we are passing uhhhh, never mind, you don't see nothing!" But no such announcement was made. 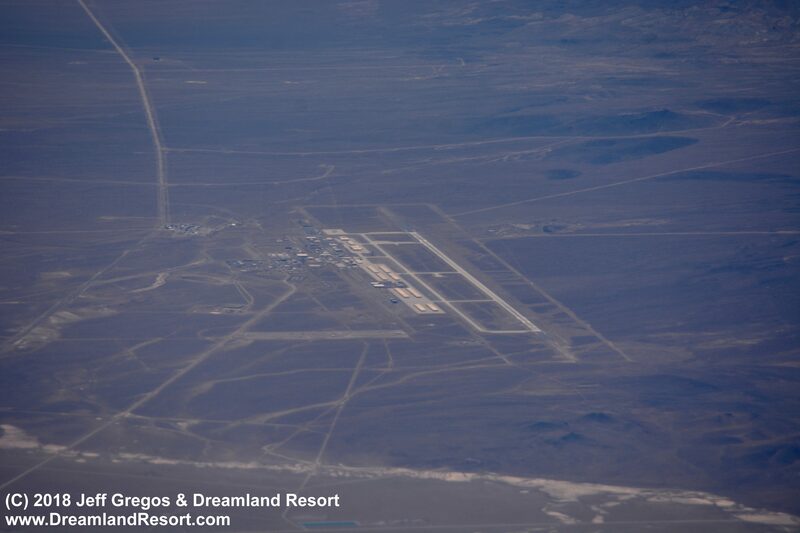 Next we flew very close to Tonopah Test Range or KTNX. I didn't see anything on the ramp but I'll zoom in when I can dump the files onto my computer later. 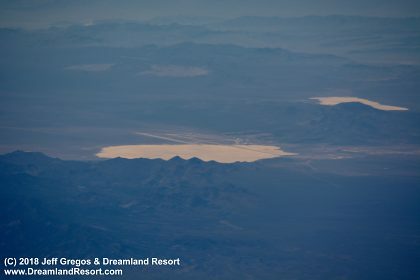 I did see a bright reflection on the north end of the lakebed with the target on it. It could have been anything including my imagination. 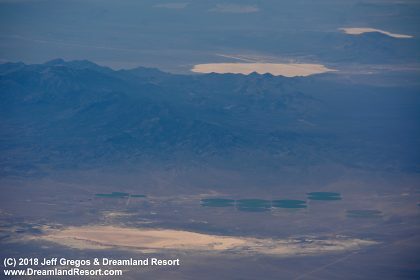 I zoomed in and didn't see anything other than desert. As we pressed on passing Mud Lake, I turned to Kim and said, "We haven't even landed in Maui yet and this is the best part of the trip!" I received a punch in my arm and then another one for flinching! Next stop, the USAF Space Surveillance Complex atop of Mount Haleakala!